As a privately held family business with over 150 years of combined experience, the Symbia Logistics team has provided facility-based supply chain support to a variety of industries including sporting goods, apparel, dry grocery, health and beauty, aerospace, chemical, industrial goods, kitting, and direct-to-consumer fulfillment services. The Symbia Executive Team has been developing customized solutions and processes for logistics clients since 1989. We consistently exceed customer expectations and establish long-term partnerships. Growing up on the floor of a warehouse, Megan has been getting her hands dirty since day one. She’s started and sold multiple businesses and found opportunities in the most challenging of situations. Megan is a pioneer among women in the rugged logistics industry, and she is now situated at the top her game overseeing a workforce of 1,300 employees. Megan’s entrepreneurial spirit, tenacity and firm conviction that we are all equal, have driven her to build powerful, successful teams. By focusing on Symbia’s strengths she has guided the company to unprecedented levels and made Symbia a formidable force in logistics. When she’s able to sneak in a little down-time, Megan and her family will hit the road to seek out and experience new places together. A lifetime of logistics has led Jim Smith to where he is today, at the helm of an international 3PL company. In true leadership form, Jim humbly attributes Symbia’s success to the entire team, while proudly owning his role in the assembly of “the strongest crew in the industry.” He is a man of few words who has structured his career around being honest and easy to work with. Jim places his trust in the judgement of his employees and enjoys the responsibility of watching over the company. A family man to the core, Jim is most proud of his kids - Megan, Tommy, Leigh Anne, Ryan, Aubrey and James - and infinitely grateful to have his wife Katy by his side. The decades of hard work have earned Jim the right to play, which typically involves traveling and trophy fishing in the tropics. With more than 25 years of experience in third-party services, Tom Flynn is no stranger to the logistics industry. 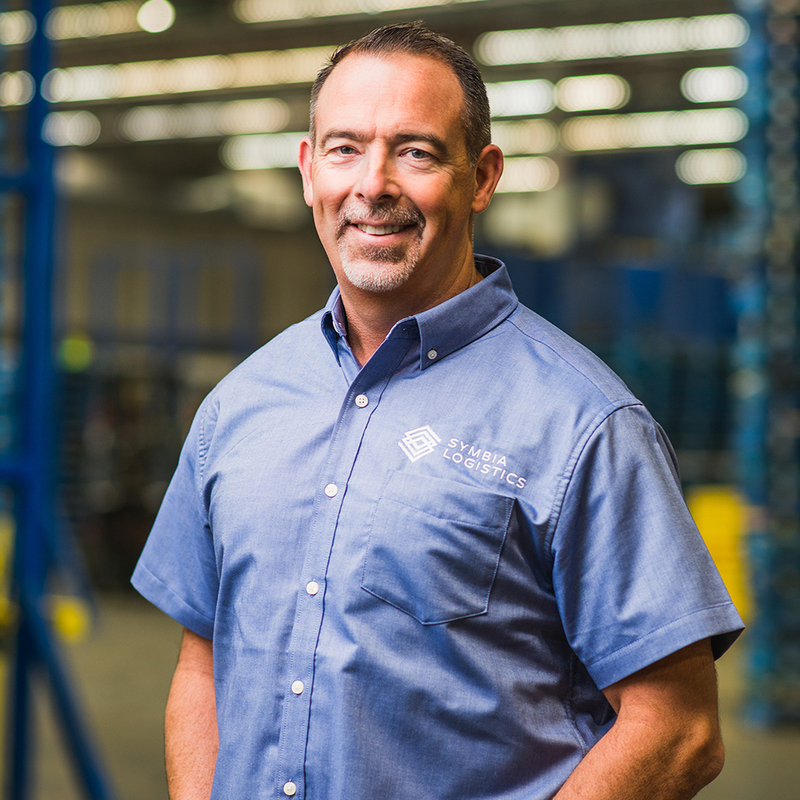 During his time as an executive with Greatwide Logistics, Tom adeptly led third-party warehousing and pallet logistics operations and now hones his skills as President of Symbia Logistics. His big picture view of the organization helped Symbia to double in size in just five short years and he continues to deliver a prosperous outlook for the foreseeable future. Tom’s mission is for Symbia to “be a company that’s easy to do business with,” and he achieves this by way of some fundamental principles: take care of your employees, be on the lookout for operational efficiencies and most importantly, always place your customer’s needs first. Tom values loyalty and integrity as guiding principles and lives for lasting relationships both professionally and personally. He is a former officer in the United States Marine Corps, and he and his wife Elizabeth have been together for more than 25 years. They are proud parents to three exceptional children, Erika, Tommy and Andrew. It takes sharp attention to detail and an understanding of the entire company to make a rock-solid CFO, and that is exactly where Dillon DeMore thrives. Since 2010 Dillon has been responsible for the financial health of Symbia, and his past experience has made him especially qualified for the task. Before joining the team Dillon operated under strict regulations as a branch president and then regional manager for a Colorado based bank, and he later developed a keen sense for budgeting as controller for a large nonprofit. Going above and beyond the typical role of a CFO, Dillon stays involved in the day-to-day operations with the team. Employees know that they can always pick up the phone and Dillon will do what it takes to resolve the requests that come his way. When he’s not crunching numbers Dillon can be found cheering for his alma mater, the University of Colorado Buffaloes, or spending time on the ski slopes with his wife Katie and their two young children, Hagen and Kayla.